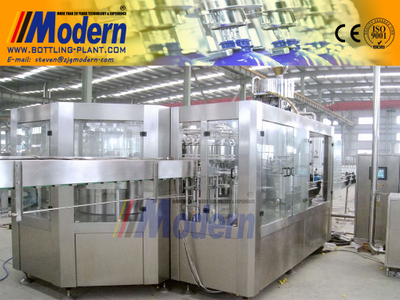 - Buy Soft Drink Filling Machine from Zhangjiagang Modern Machinery Co., Ltd.
XFGD series soft drink filling machine is composed of rinser, filler and capper, which is special designed for your glass bottle filling. 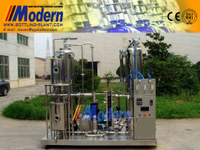 we design the balance pressure filling method with vacuum process and CIP cleaning fuction. 2) The convey chain used stainless steel 304 material for long time use. 3) The high efficiency atomizing spray nozzle installed on bottle clamp is capable of cleaning any part of bottle inner wall, and also saves rinsing water. 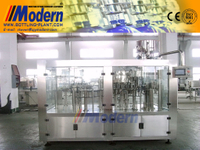 4) The rinser is driven by driving system positioned inside machine frame via gear transmission. 2) Filling valves are made of SUS304. 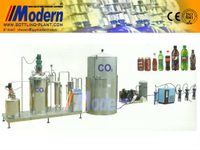 3) Long-tube filling valves are adopted, with CO2 fully exchanging with air inside glass bottles, to decrease the rinsing of oxygen effectively. 4) High-pressure foam stimulator is equipped to minimize air remaining at the neck. 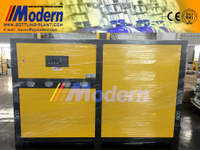 5) Centralized automatic lubrication system, simple for maintenance. 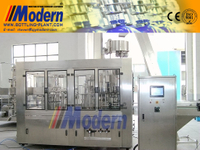 1) Cap distributing chute is equipped with reverse cap stop and reverse cap pick-out mechanism. 2 Cap distributing chute is equipped with a photocell switch to stop the capper when there is no cap inside the chute. 3) The capper is equipped with inlet bottle detection switch. 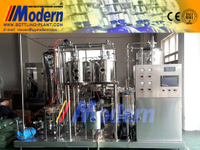 4) Centrifugal way of cap arranging is adopted to reduce damage of caps. 5) A cap inspecting system is applied to control on-off of cap elevator. 1) Driving motor is frequency inverted to synchronize with the filling line to prevent bottles from falling. 2) Discharge conveyor is equipped with photocell switch to slow down and stop filling line in case of fallen bottles.